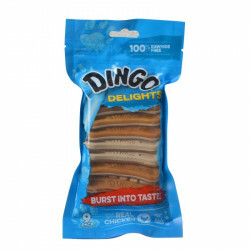 Dingo Dental Sticks are packed with real chicken bits molded into easy to chew treats that dogs cannot resist. Dental Stix help maintain extra clean teeth and fresh breath. Dingo Dental Stix have a delicious taste plus the teeth cleaning power of Baking Soda, Chlorophyll and Parsley Seed. Dingo Dental Sticks are safe for all dogs. Ingredients: Rawhide, Chicken, Rice, Calcium Carbonate, Sodium Bicarbonate, Dextrose, Salt, Parsley Seed Oil, Tetrasodium Pyrophosphate, Glycerin, Sorbitol, Potassium Sorbate (preservative), FD&C Blue 1, FD&C Yellow 5. All my dogs love the Dental sticks I bought for them. These sticks help keep their teeth clean from tarter buildup. Bought in Bulk the Dingo Dental Sticks and it's an Awesome deal. Not only that my Doggies Love them, I also Love the great Bulk price and the excellent Customer Service & Fast Shipping by Pet Mountain. Thanks for giving good service! Dingo Dental Sticks are helping to keep my dog's teeth clean, my dog loves them, and PetMountain has the best price. My dog Lucy LOVES these dental chews. She is 12 years old and these dental chews are the only thing she has had for dental hygiene. We tried the toothpaste and brush routine once and only once. She reacted quite nastily to the brushing and obviously abhorred the experience, that finding alternate means was necessary. (She's a big girl at 145 pounds.) I forgot how or where we originally found Dingo dental chews, but she has been given these for most of her life. The vet is always amazed at her teeth and gums, telling us that Lucy's dental health is comparable to a one-year-old's mouth and to keep on doing what we're doing. The vet was shocked to learn that we do not brush her teeth (HAH! No way--too dangerous!) and now recommends the Dingo dental sticks for dogs. At first, I was concerned about they're coming from China, but Lucy hasn't ever had any ill effects (great teeth), and the Chinese government is quick to arrest (and execute) those who soil the country's export reputation. Lucy loves these Dingo sticks, and I love Lucy...so, I buy these sticks two cases at a time. I'm a repeat-orderer. Dog loves them and his teeth look fantastic (...I don't brush his teeth w/a brush and paste like I should). Do not leave residue on carpet. I bought these for my bulldog (Lola). She has trouble chewing on stuff but these work very well without choking her! I used to buy a much more expensive product that looked very similar but it seems to have been discontinued (forgot the name). It forced me to look elsewhere and I found these. 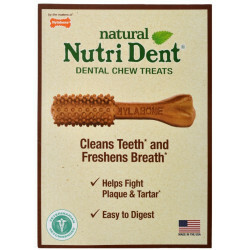 My dog gets them twice a day, he loves them and they produce the same results: fresh breath and clean teeth. Locally, these are about half again more expensive than buying them (48-count) through Pet Mountain, so they're an excellent bargain. Our dogs love these and get their "Treat-Treat" every evening. These showed up on-time and should keep these treats off our shopping list for 6 more months without breaking the bank. These are my dog's fav (he's a Collie/Aussie Shepherd mix) & help his teeth being whiter, but they're now being made in China, which is a concern. Had stuff that I could not find anywhere else. Shipped and received the dates they promised. I thought this product was natural...it had artificial colors and I would not serve it to my dogs. Received on time and good price. Dingo Dental Stix are the Best! My pug, Chang, loves them. They're his favorite after-dinner treat. My local pet stores are usually out of them and I was glad to find them online at PetMountain ... and cheaper, too! Keep our dogs' teeth sparkling white! We have 4 dogs and do not brush their teeth. I give them each one of these 5 times a week and at their last exam the vet said their teeth look fantastic, as if we've been brushing them! The dogs love them and the price is right! Highly recommended! These dental stix are perfect for our rescued Puggle. He needed to have some teeth pulled when we first found him. The Dingo Dental Stix allow him to chew on on a dental chew that he can handle with teeth missing. Plus, he loves them. 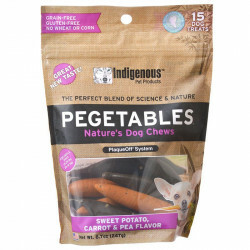 My dog loves these and they are good for her teeth, gums and breath! She's a small dog and these are the perfect size. I find bits of them around the house, which can be annoying, but in general we love these products!